Who makes the important decisions in your organization? Strategy, product development, budgeting, compensation—such key decisions typically are made by company leaders. That’s what bosses are for, right? But maybe the boss isn’t the best person to make the call. In The Decision Maker, a leadership fable loosely based on Bakke's experience, the New York Times bestselling author shows us how giving decisions to the people closest to the action can transform any organization. Do You Truly Make the Tough Calls? Coaches don’t play sports. When the whistle blows and the game begins, it’s not the coaches who run onto the field or the court, it’s the players that the coaches have chosen. In The Decision Maker, author Dennis Bakke returns to this metaphor a number of times: coaches choose the players. The theme of The Decision Maker is that bosses should not be making decisions in a company; they should be choosing the decision makers. The decisions themselves should be made by everybody else — including, and perhaps especially, the front-line employees. 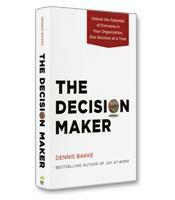 The Decision Maker is a business fable; Bakke uses the story of a midsize company recently acquired by two business partners — one of whom champions the decision-making revolution in the company — to illustrate the potential benefits and obstacles related to pushing decision-making down the organizational hierarchy. According to Bakke, benevolent paternalism is the kind of mindset that still defines most of today’s businesses. 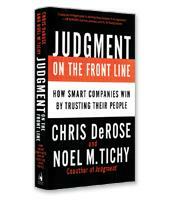 Bosses make the decisions, even though they are less informed than the people closer to the “action” — the people who are actually dealing with customers or making the product. Shouldn’t the workers on the assembly line be making assembly line decisions? Shouldn’t the techs that transform the ideas of the R&D researchers into prototypes be making decisions about how the prototypes are to be built? In many companies, they are not making the decisions, and as a result, according to Bakke, they are disengaged, unmotivated, and just working to collect a paycheck and go home. Treat people like machines and they will act like machines, he writes. In Bakke’s story, the former head of the company was a traditional, top-down control executive. Tom, the new co-owner, sees that he has acquired a company filled with uninspired employees. It’s not just a question of morale. As described by Bakke, the top-down command-and-control culture of the company shackles employees trying to do their jobs. For example, the story begins with an explosion on the manufacturing floor. No one was injured, not even the worker assigned to the machine that exploded; he was away from the machine because he was looking for his boss to get permission to shut the machine down. He knew the machine needed to be shut down, but he didn’t have the authority to make that decision. For Tom, every person in the company is unique, a creative thinker, capable of learning and capable of taking on a challenge. Every person, in other words, is capable of making decisions. When Tom decrees that employees will be making the decisions that concern their work, the resistance from the managers is palpable. 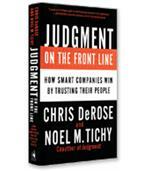 First, managers wonder what their jobs will become if they are not making the decisions. Tom replies that, just like coaches, their job is to choose the decision-makers — a serious decision based on the managers’ knowledge of the tasks at hand and the experience and professional attributes of their employees. Managers are also concerned about the capabilities of employees who are not used to making decisions. These concerns seem to be borne out when a front-line employee decides to change suppliers, a move that leads to disastrous results. At this point in the story, Bakke introduces a key component of his decision-maker process: advice. Decision-makers must ask for advice from peers, bosses and employees below them in the hierarchy — anyone who has the experience and knowledge to help. It is, however, up to the decision-maker to make the final decision and to take full responsibility for that decision. The former head of a Fortune 200 global power company and the founder of Imagine Schools, Bakke is not an academic theorist but a successful business leader who has implemented the decision-making program described in the fable. The PowerPoint presentation included at the end of this thought-provoking book summarizes the program succinctly and provides a simple guide for those who will have the vision (and courage) to follow Bakke’s lead.